Decorative Life: Weeks to months depending on conditions. Reported good cultivars for both leaf and stem colors include ‘Cardinal’, ‘Flaviramea’ and ‘Bud’s Yellow’. Is a member of the Cornaceae (dogwood) family. Native to the Eastern North America. Two not so common relatives are Aucuba and Griselinia. This species if often listed under C. baileyi and C. sericea. However, The Royal Horticultural Society “Dictionary of Gardening” and the taxonomic authority for this Internet site lists them all under C. stolonifera. Stems of various colors (red – yellow) are cut to various lengths. Can be stored in water for 6-10 weeks and longer if sealed in plastic bag to maintain high humidity. Cornus is Latin for “horn” and refers to the hard wood, which was used by the Greeks and Romans to make javelins and spearheads. The name dogwood refers to the use of a decoction of the leaves to wash fleas from dogs. 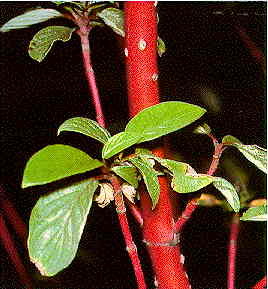 Dogwood is sometimes called the “crucifixion tree” because the flower-like bracts are in the shape of a cross and each bract has a brown spot or “blood stain” at the base. Cut dormant branches of C. florida can be forced into bloom by immersing them in 82 F water for 12 hours, then placing them upright in opening solution at 59-64F and high humidity for 1-3 weeks. Plant parts have been used to make gunpowder, soap, dye (used to color Turkish fez), ink, toothbrushes and fish intoxicant. The bark contains small amounts of quinine.